2.1 Earth is constantly changing as energy flows through the system. Geologic, fossil, and ice records provide evidence of significant changes throughout Earth’s history. 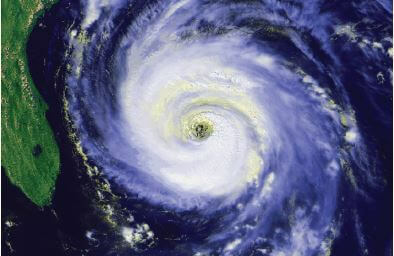 These changes are always associated with changes in the flow of energy through the Earth system. Both living and non-living processes have contributed to this change. Caption: This geothermal power plant in Iceland makes use of high temperatures beneath Earth’s surface to generate electricity. 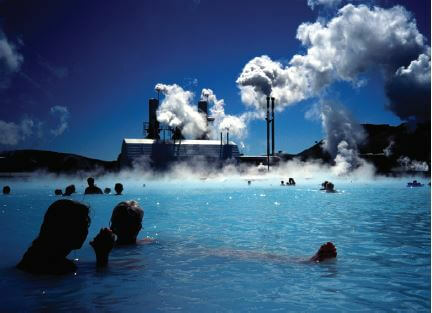 Nearby, people enjoy hot water heated by the same sub-surface energy sources. 2.2 Sunlight, gravitational potential, decay of radioactive isotopes, and rotation of the Earth are the major sources of energy driving physical processes on Earth. Sunlight is a source external to Earth, while radioactive isotopes and gravitational potential, with the exception of tidal energy, are internal. Radioactive isotopes and gravity work together to produce geothermal energy beneath Earth’s surface. Earth’s rotation influences global flow of air and water. 2.3 Earth’s weather and climate are mostly driven by energy from the Sun. For example, unequal warming of Earth’s surface and atmosphere by the Sun drives convection within the atmosphere, producing winds and influencing ocean currents. 2.4 Water plays a major role in the storage and transfer of energy in the Earth system. The major role water plays is a result of water’s prevalence, high heat capacity, and the fact that phase changes of water occur regularly on Earth. The Sun provides the energy that drives the water cycle on Earth. 2.5 Movement of matter between reservoirs is driven by Earth’s internal and external sources of energy. These movements are often accompanied by a change in the physical and chemical properties of the matter. Carbon, for example, occurs in carbonate rocks such as limestone, in the atmosphere as carbon dioxide gas, in water as dissolved carbon dioxide, and in all organisms as complex molecules that control the chemistry of life. Energy drives the flow of carbon between these different reservoirs. 2.6 Greenhouse gases affect energy flow through the Earth system. Greenhouse gases in the atmosphere, such as carbon dioxide and water vapor, are transparent to much of the incoming sunlight but not to the infrared light from the warmed surface of Earth. These gases play a major role in determining average global surface temperatures. When Earth emits the same amount of energy as it absorbs, its average temperature remains stable. 2.7 The effects of changes in Earth’s energy system are often not immediately apparent. Responses to changes in Earth’s energy system, input versus output, are often only noticeable over the course of months, years, or even decades.